More Time, More Money, More Life! Many aspire to have more in their lives, but what is more? More is relative. One person’s mountainous goal may be just a slight rise on the horizon for another. Lofty aspirations for one might be the bare minimum for another. More seems to depend upon the perception of the seeker. We all allow our internal filters to prevent us from getting what we really want out of both our professional and personal lives. Ole Carlson will help you break that restrictive pattern through a inspiring plan for achieving more—more time, more money, more life. In Aspire, Carlson dissects the success-creation process and lays out simple methods to help you overcome your self-made limitations. You will learn how to live the life you desire—and deserve. By applying the law of attraction and the manifestation trilogy, a three-step transformative process of personal growth, you can apply the laws of the universe to work in your favor. And Carlson can show you how. 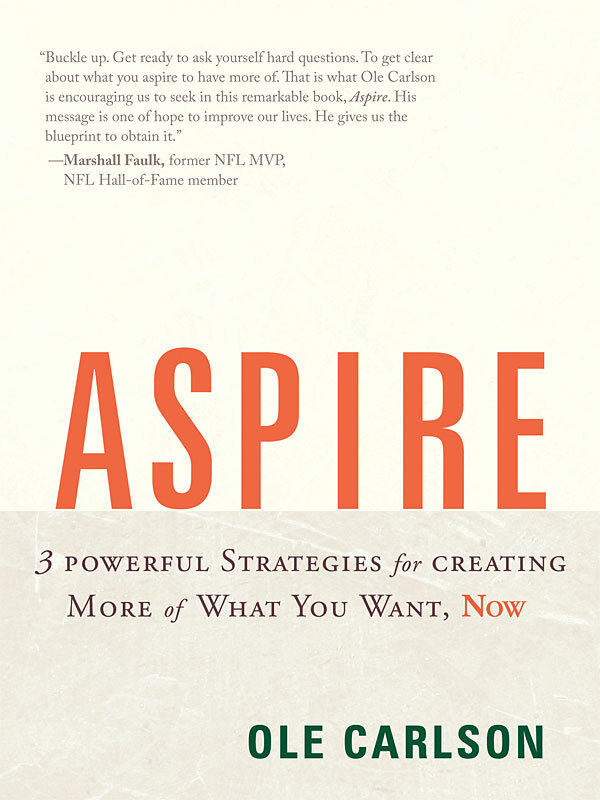 Based largely on anecdotes from the author’s own extraordinary life and inspired by teachers ranging from the Buddha to Tony Robbins, Aspire will guide you in your quest for more. You can purchase the book online from Amazon at http://www.amazon.com/ASPIRE-Powerful-Strategies-Creating-ebook/dp/B0055TKOSE/ref=tmm_kin_title_0?ie=UTF8&m=AG56TWVU5XWC2&qid=1313599093&sr=1-2.